Methicillin-resistant Staphylococcus aureus (MRSA) infections are caused by a type of staph bacteria that has become resistant to the antibiotics used to treat ordinary staph infections. The rise of MRSA infections is limiting the treatment options for physicians and surgeons. 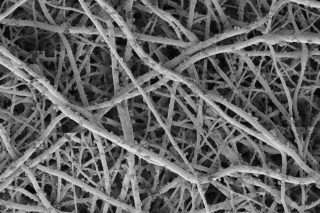 Now, an international team of researchers, led by Elizabeth Loboa, dean of the University of Missouri College of Engineering, has used silver ion-coated scaffolds, or biomaterials that are created to hold stem cells, which slow the spread of or kill MRSA while regenerating new bone. Scientists feel that the biodegradable and biocompatible scaffolds could be the first step in the fight against MRSA in patients. "Osteomyelitis is a debilitating bone infection that can result when MRSA invades bone tissue, including bone marrow or surrounding soft tissues," said Loboa, who also is a professor of bioengineering. "Increasingly, those in the healthcare profession are running out of choices when it comes to treating MRSA while regenerating tissue. Using previously reported scaffolds that were created in our lab, we set out to determine the efficacy of coating these structures with silver ions and whether they were useful in treating or preventing osteomyelitis." The scaffolds were created from a polymer called polylactic acid (PLA), which is an FDA approved material that eventually biodegrades in the body. Next, researchers applied a silver ion releasing coating to the scaffolds and "seeded" them with fat-derived adult stem cells that could be "triggered" to create bone cells. Researchers also seeded the scaffolds with MRSA so that they could observe whether silver ions could fight the bacteria. The scientists found that the silver ion-releasing scaffolds not only inhibited MRSA, but also supported bone tissue formation. "Silver is well known for its antimicrobial properties and is highly toxic to a wide range of microorganisms such as MRSA," Loboa said. "Silver ions work mechanically—they actually disrupt the cellular machinery of MRSA. Our research now has shown that bone tissues still can be formed even in the presence of MRSA. We've created the materials needed for bone tissue engineering that will allow patients to use their own fat cells to create patient-specific bone and surgically implant those cells and tissues while diminishing, or potentially eliminating, the risk of MRSA infection." The early-stage results of this research are promising. If additional studies are successful within the next few years, MU officials could request authority from the federal government to begin human device development. After this status has been granted, researchers may conduct human clinical trials with the hope of developing new treatments for osteomyelitis. Their findings, "Evaluation of Silver Ion-Releasing Scaffolds in a 3-D Coculture system of MRSA and Human Adipose-Derived Stem Cells for Their Potential Use in Treatment or Prevention of Osteomyelitis" recently was published in the journal Tissue Engineering, Part A.